Americas gateway to the universe. Leading the world in preparing and launching missions to Earth and beyond.August 28, 1998 John F. Kennedy Space CenterVol. 37, No. 17 Spaceport News NASA at KSC awarded ISO certification As KSC heads toward the new millennium and an era of new growth and opportunity, one of the worlds leading ISO certification organizations, Det Norske Veritas (DNV), presented Center Director Roy Bridges with a certificate of ISO registration for Kennedy Space Center. On Aug. 11, DNV Southeastern Regional Manager Dalton Lyon congratulated Bridges for the achievement of each NASA organization at KSC for having met the requirements for ISO 9001 certification. (See ISO, Page 7) NASA began to conduct space missions within months of its creation, and in its 40 years has made historic achievements in many areas of aeronautics and space research. NASAs best-known efforts are the human space flight initiatives. Also, the space science programs to date have included missions to all the planets in our solar system except Pluto. The core mission of any future space exploration will be humanitys departure from Earth orbit and journeying to the Moon or Mars, this time for extended and perhaps permanent stays. The next generation of launch vehicles taking us from the Earth into orbit are being developed right now. The X-33, X-34, and other hypersonic research projects presently underway will help enable routine, affordable access to space in the first decades of the 21st century. An initial effort in this area was NASAs Skylab program in 1973. After Apollo, NASA used its huge Saturn rockets to launch this prototype orbital space workshop. There were three human Skylab missions, with the crews staying aboard the orbital workshop for 28, 59, and then 84 days. The first crew manually fixed a broken meteoroid shield, demonstrating that humans could successfully work in space. The Skylab program also served as a successful experiment in longduration human spaceflight, paving the way for future generations of space travelers. KSC Director Roy Bridges announced on Aug. 21 the selection of Space Gateway Support (SGS) of Herndon, Va., for award of a government contract to perform base operations for Kennedy Space Center and the 45th Space Wing, which includes Cape Canaveral Air Station and Patrick Air Force Base. SGS is a joint venture of Northrop Grumman Technical Services, Herndon, Va.; ICF Kaiser Defense Programs, Inc., Fairfax, Va.; and Wackenhut Services, Inc., Palm Beach Gardens, Fla. In an unprecedented display of cooperation, two government agencies will combine resources and requirements to cut expenses, reinvest savings and consolidate This is for you!, Roy Bridges exclaimed to the KSC audience as he held up the ISO certificate recognizing compliance with the ISO 9001 standard. (See Hurricane, Page 2)Joint base operations support contractor announced at KSC For many years, Kennedy Space Center has been the world leader in space launch technology, said Lyon. Today, you continue to pursue that leadership. You have selected to pursue it through this business management system that you have implemented here ... to maintain your leadership in the world. The presentation followed a successful independent audit by DNV of the KSC Management System in May of this year.Looking Bonnie in the eye Two specially equipped NASA research aircraft were pressed into service last weekend, providing real-time data for the operational forecast of Hurricane Bonnie. The aircraft arrived a few weeks ago to begin collecting high-altitude information about Atlantic hurricanes and tropical storms to better understand and improve ground-based predictions of hurricanes. The Convection and Moisture Experiment (CAMEX) mission is being conducted in August and September. Results from the mission may increase warning time (saving lives and property) and decrease the size of the evacuation area (saving money) while giving scientists (See J-BOSC, Page 3) functions with the objective of remaining competitive in a global launch market. Under this single-contract acquisition approach for base support operations, we will have a great potential to increase savings and enhance customer support and performance, said Bridges. This new acquisition approach will save the government a substantial sum over the 10 years of the contract if all options are exercised. The cost-plus award fee contract features a five-year basic performance period, beginning Oct. 1, 1998, and an option for a five-year extension. The potential value of the contract, called the Joint Base Operations Support Contract (J-BOSC), exceeds $2 billion over 10 years. SGS will perform work that is being performed by Kennedys Base Operations contractor, EG&G Florida, and the 45th Space Wings Launch Base Support contractor, Johnson Controls, and 16 other individual base-support contracts. Other primary J-BOSC customers are government contractors for NASA and Air Force space flight operations, payload ground operations, life sciences, expendable vehicles, launch operations and support, and elements of the Navy and the Department of the Interior. SPACEPORT NEWSAugust 28, 1998 Page 2 Brown named CIO for KSCBarbara Brown Bonnie gives this NASA Dryden Flight Research Center DC-8 a jump-start toward its goal of collecting high-altitude information about Atlantic hurricanes and tropical storms. Flying at 35,000 to 40,000 feet, the plane is equipped with instruments to measure the storms structure, environment and changes in intensity and tracking. The DC-8 is part of the NASA-led Atmospheric Dynamics and Remote Sensing program that includes other government weather researchers and universities in a study of Atlantic hurricanes and tropical storms.Hurricane ...(Continued from Page 1) This DC-8 is one of two aircraft to be flown in a study through September to learn about storms from top to bottom. Barbara Brown has been named KSCs new chief information officer (CIO), succeeding Jimmy Akin, who retired Apr. 3. As CIO, Brown has centerwide responsibility for a broad range of information technology activities including planning, security, program integration and implementation, information resources application reengineering, architecture and policy for all KSC communication and computing systems. Brown is responsible for the assessment of information processing problems and the definition of technological requirements and potential solutions. Her office serves as the center resource for analysis of all state-of-the-art software and hardware tools. Brown joined KSC in 1982 as a cooperative education student in the Engineering Development Directorate. In 1987, she transferred to the Artificial Intelligence Laboratory, where she worked as a systems engineer and subsequently became the advanced software laboratory manager, leading advanced system development and demonstration. In 1996, Brown was assigned to the Future Launch Systems and Advanced Programs Office, where she served as the X-34 project engineer. She has a bachelor of science degree in computer science from Florida State University and a master of science degree in engineering management from the University of Central Florida. a better understanding of these dramatic weather phenomena. The media were briefed on Aug. 12 and toured the two NASA aircraft a DC-8 and an ER-2 at Patrick Air Force Base. The DC-8 carries 11 or 12 instruments and about 40 scientists, said Robbie Hood, lead mission scientist with the Global Hydrology and Climate Center at the Marshall Space Flight Center in Huntsville. The ER-2, a high-altitude research plane, carries a lone pilot, measuring the storms structure and surrounding atmosphere that steers the storms movement. Led by the Atmospheric Dynamics and Remote Sensing program at NASA Headquarters, the experiment unites eight NASA centers, other government weather researchers and the university community for a coordinated, multi-agency and multi-university Atlantic hurricane and tropical storm study. CAMEX will yield highresolution spatial and temperature information on hurricane structure, dynamics and motion, leading to improved hurricane prediction. Results also will be used to validate existing measurements from the Tropical Rainfall Measuring Mission of hurricanes and tropical storms and to develop algorithms for future Earth science missions. We only know what goes on in the bottom half of a hurricane, from sea level to 27,000 feet, said Hood. With all of the agencies and the university community working together, we now can learn about these storms from top to bottom. When a hurricane or tropical storm erupts in the Atlantic, the DC-8 equipped with instruments to measure the storms structure, environment and changes in intensity and tracking flies into the storm at 35,000 to 40,000 feet. At the same time, the specially equipped Dryden ER-2, a highaltitude research plane, soars above the storm at 65,000 feet. On the ground, the storm research team launches weather balloons and monitor land-based sensors to validate the high-altitude measurements taken by instruments aboard the planes. Hood and her team are flying the NASA planes in conjunction with scheduled storm flights of the National Oceanic and Atmospheric Administration (NOAA) that will take off from MacDill Air Force Base, Tampa, Fla., and the Hurricane Hunters the U.S. Air Forces 53rd Weather Reconnaissance Squadron from Keesler Air Force Base, Miss. The Air Forces Hurricane Hunters and NOAA routinely fly into tropical storms and hurricanes to determine the location, motion, strength and size of the storm. The information that the two organizations gather is used to predict the potential strength and size of the storm as well as potential landfall locations. We have instruments here for the first time which can measure moisture with high vertical resolution in and around the hurricane, said Dr. Ramesh Kakar, Earth science program manager at NASA Headquarters. The NASA planes can augment the altitude region covered to date, he added. We can augment from 25,000 feet to almost the height of the hurricane and the ER-2 can fly overhead. Both the NASA and the DC-8 have state-of-the-art Doppler radars and can keep very close tabs on convective activity. NOAA flies a WP-3 Orion (a four engine turboprop plane) into storms at altitudes below 27,000 feet. And the Hurricane Hunters fly a WC-130 Hercules (a four-engine turboprop aircraft) at 5,000 to 10,000 feet. Scientific instruments provided by Marshall to be flown on the Dryden aircraft are enhanced by instruments from NASAs Goddard Space Flight Center, Greenbelt, Md. ; Jet Propulsion Laboratory, Pasadena, Calif.; Langley Research Center, Hampton, Va.; and Ames Research Center, Moffett Field, Calif.
SPACEPORT NEWSPage 3 August 28, 1998J-BOSC ...(Continued from Page 1)J-BOSC Contract Consolidations Air Force ContractsFire, Security Fac., Sys., Eq. & Util. (partial) Roads and Airfield Disaster Preparedness Contaminated Material Cleanup and Tank Removal Mail CCAS Furniture, Office Moves Fire Suppression Sys. Automatic Doors Laundry/Dry Cleaning Vehicle & Equip O&M Transient Alert/AGE Maintenance* PMEL Calibration* Grounds Maintenance CCAS/PAFB Asbestos Removal Elevator Maintenance Family Housing Maint. Custodial (PAFB) Oil/Water Separators Pest Control CCAS Refuse Collection CCAS/PAFB Athletic Field Maintenance WEB SITE: http://www.ksc.nasa.gov/procurement/BSC/bschome.htm*priced option FY99 FY00 FY01 FY02NASA ContractsFire, Security Facilities, Sys., Eq. & Util.,including but not limited to: Power & Light, HVAC, Water & Sewage, Buildings and Structure, Furniture, Office Moves, Fire Suppression System, Automatic Doors, Elevator Maintenance, Asbestos RemovalRoads and Grounds Airfield Supply Mail Library Printing & Micrographics Graphics & Publications Custodial Transportation Computer Systems *Communication Services Propellants Life Support Occupational Medicine Environmental Health Aircraft O&M *PGOC Calibration KSC Shuttle Bus Drivers J-BOSC also will serve commercial customers such as The Boeing Company, LockheedMartin, Orbital Sciences Corp., Astrotech (SPACEHAB) and Spaceport Florida Authority. Types of work covered under the J-BOSC are: project management; public works including engineering services and infrastructure; base support services such as protective services, fire protection, logistics, information technology, administrative, medical and environmental services; and installation improvement. The Joint Performance Management Office, a new organization staffed with a mixture of NASA and Air Force employees, will manage the J-BOSC contract. The Executive Director of the office will report to a Board of Directors. The boards chair and vice chair will rotate every two years between the KSC director and 45th Space Wing commander. The management approach for this contract is significantly improved over what we currently do, Bridges said. We have a very lean insight concept which emphasizes the performance-based nature of the contract. Lightning strikes Launch Complex 36 only 49 seconds after liftoff of Atlas-Centaur 67 in March 1987. It passed through the vehicle, altering data in the Atlas guidance system and commanding a maneuver that exceeded the structural capability of the vehicle, destroying it and the payload. The lightning occurred as the Atlass long, hot ionized exhust plume entered a region of electric fields in the atmosphere. Such triggered lightning is a threat to space vehicles and also aircraft.When lightn ing strikes...Kennedy Space Center, due to the need to protect Space Shuttles and other launch vehicles, has performed extensive research into lightning, its causes and how to detect and forecast it. This information has been applied toward improved lightning warning and protection systems. the KSC Lightning Protection System. KSC operates extensive lightning protection and detection systems in order to keep its employees, the 184-foothigh Space Shuttle, the launch pads and processing facilities from harm. While the protection system is exclusively on KSC property, the detection system incorporates equipment and personnel both at the space center and Cape Canaveral Air Station. The first line of defense for lightning detection is accurate prediction of when and where thunderstorms will occur. The Air Force 45th Weather Squadron provides all weather support for KSC/CCAS operations except Space Shuttle landings, for which support is provided by the Spaceflight Meteorology Group at Johnson Space Center. Information provided by the 45th Weather Squadron includes lightning advisories that are critical for day-to-day Shuttle and payload processing, as well as launch day weather data essential to help NASA determine when it is safe for the Space Shuttle to lift off. SPACEPORT NEWSAugust 28, 1998 Page 4 In a very short time, the dawn of a new millennium will be upon us. With the coming of this new era, NASA created a program to develop and test an arsenal of new technologies and concepts. The agencys New Millennium program is preparing for the time when humankinds robotic (and, eventually, human) emissaries to space are routinely reporting back inspiring discoveries from throughout the solar system and beyond. Though testing technologies is the primary goal of the program, the missions also provide an opportunity to collect scientifically valuable data. Deep Space 1, scheduled to launch aboard a Boeing Delta II rocket on Oct. 15, is the first mission in the New Millennium program. The spacecraft arrived at the Kennedy Space Center on Aug. 16 to begin prelaunch processing. Undertaking this vision is a challenge for engineers who must develop and design the extraordinary spacecraft of the future. Among the experiments aboard Deep Space 1 is an ion propulsion engine strikingly similar to those described in futuristic science fiction works. Software is also on board to track celestial bodies so that the spacecraft can make its own navigational decisions without the intervention of ground controllers.Deep Space 1 testing tomorrows technology today Ion propulsion will permit faster access to important and fascinating destinations in the solar system. Such revolutionary technologies, and others to be validated on subsequent New Millennium missions, will be among the key experiments never done before, while keeping the cost of the flight to a minimum. Although there will be 12 advanced technologies on Deep Space 1, the rest of the spacecraft will be composed of low-cost components that have been tried and tested on other missions. The Deep Space 1 flight computer, for instance, is based on the flight computer used during the Mars Pathfinder mission. With most of the components mounted on the exterior, accessibility simplifies replacement during integration and testing. The spacecraft currently is being processed in the Payload Hazardous Servicing Facility (PHSF) located in the KSC Industrial Area. Among the processing activities to be performed are the attachment to the spacecraft of the Plasma Experiment for Planetary Exploration (PEPE) instrument and the attachment of the solar arrays, each of which is among the dozen new technologies being tested. There is to be a functional test of the advanced technology science instruments as well as of the basic spacecraft subsystems. Checks of Deep Space 1s communications system will be performed including a verification of the spacecrafts ability to send data to the Jet Propulsion Laboratory via the tracking stations of the Deep Space Network. Also, the last of the thermal blankets will be installed. Finally, before the spacecraft leaves the Payload Hazardous Servicing Facility, it will be fueled with its hydrazine attitude control propellant. Then, on Sept. 22, it is to be transported to a spin test facility on Cape Canaveral Air Station, where it will be mated to a Star 37 solid propellant upper stage, and the combined elements will undergo a series of spin balance tests. Meanwhile, at Complex 17, the Delta II rocket will be undergoing erection and prelaunch checkout by Boeing. The first stage is scheduled to be lifted onto the pad on Sept. 10.Workers maneuver the Deep Space 1 spacecraft into place for prelaunch processing in KSCs Payload Hazardous Servicing Facility. Onboard experiments include an ion propulsion engine and software that tracks celestial bodies so the spacecraft can make its own navigational decisions without the intervention of ground controllers. tools NASA will need to begin a new era in space exploration. At launch, Deep Space 1 weighs only 1,080 pounds fully fueled and is just 8.2 feet high, 6.9 feet deep and 5.6 feet wide, including such attached items as twin stowed solar arrays. When those arrays are deployed, the width will grow to 38.6 feet across. Deep Space 1 should complete most of its mission objectives during the first two months after launch, well before its encounter with an asteroid, where it will further test its new instrument technologies and new navigation technology. It will continue validating these instruments in July 1999 while doing a flyby of the nearEarth asteroid named 1992 KD. When Deep Space 1 flies by the asteroid, it will be an amazing 10 kilometers away from the astral body (unless the onboard autonomous navigation system decides to take the craft to an even closer five kilometers away). Deep Space 1s experimental instruments will allow it to perform (See Deep, Page 8)Wearing protective suits, workers ready NASAs Deep Space 1 spacecraft for prelaunch processing in KSCs Payload Hazardous Servicing Facility. Targeted for launch Oct. 15, the first flight in NASAs New Millennium Program is designed to validate 12 new technologies for scientific missions of the next century. Experiments include an ion propulsion engine and software to track celestial bodies so the spacecraft can make its own navigational decisions. Deep Space 1 will complete most of its mission objectives in the first two months, but will also do a flyby of a near-Earth asteroid in 1999. SPACEPORT NEWS August 28, 1998 Page 5 On Aug. 20, about 150 Kennedy Space Center launch team members responsible for issuing Shuttle launch commands eagerly staffed their control room consoles unaware of the devilish dilemmas they would face. And thats exactly how the KSC Simulation Team (Sim Team) wanted it. KSCs launch pads have been quiet since the last Space Shuttle launch in June, but the Launch Control Centers control rooms have maintained a steady rumble of progress during a break in this years launch schedule. Relying on tests and simulations to keep a sharp edge, the team will be poised and ready for Shuttle Discoverys liftoff targeted for Oct. 29. The best teacher for our team is the experience of a real launch countdown, explained KSCs Deputy Director of Shuttle Processing Dave King. We normally launch every six to eight weeks, but when summer brought a five-month pause between launches, we went to work developing a practice schedule that would keep the team fresh. Control room engineers must be certified to perform their jobs and are required to participate in a battery of standard prelaunch tests before every launch. Managers are taking advantage of the available time this summer to augment the standard year-round training. Between June 2 and Oct. 29, the team will have conducted three external fuel tank loading simulations, a simulated loading of hypergolic propellant into the orbiter maneuvering system and reaction control system and two integrated launch countdown simulations. Integrated simulations are a major event in the processing activity supporting the mission and require considerable preparation. The control room, normally used for daily test operations, is set up with software used to simulate flight and ground systems in the launch configuration. Engineers and test operations personnel are removed from daily tasks and assigned to their respective launch count responsibilities. These practice sessions can zero in on a specific Shuttle subsystem and its support engineers, or in the case of the Aug. 20 integrated simulation, pull the entire firing room staff together for a complete Shuttle system dry run. The test began with a typical call-to-stations, then a staged countdown start at the T-20 minute mark and continued until the launch was aborted at about noon. A crafty group of so-called gremlins conjures up glitches and troubles for the launch team to solve during the simulation. Its our job to stress the team and prepare them to be ready for the worst-case scenario, said Paul Krause, Sim Team member and United Space Alliance (USA) avionics manager. We throw 12 to 14 major problems at them between T-20 minutes and T-0, and you only see one or two during a real countdown, if any, added Krause. If everything that we threw at them really happened, it would be a bad, bad day. The Sim Team consists of KSCwith gremlins on the groundengineers that have other full-time responsibilities, but take their parttime gremlin duties very seriously. Debbie Frostrom, NASA test director, helped set up and plan this summers test schedule and has experienced the stress at the NTD console first hand. The test plan and problem scenarios are kept secret from the players in the simulation, she said. It never ceases to amaze me when they find something new to stretch the team. These guys know the Shuttle systems inside and out and their scenarios make you think at extraordinary depth. A software model plugged into KSCs launch processing system mimics the Shuttles many components and systems. The Sim Team introduces a wide range of bogus bugs into the software system from false sensor indications and system failures to operational weather violations. Console engineers must identify the problems, prioritize them and respond accordingly. Adding to the realism, the software replies to their commands, and participants observe video footage of prelaunch milestones occurring on their console monitors. As the drama unfolds, the Sim Team monitors the progress of the test from the control room next door. The launch teams communication network becomes an actors stage, as console engineers hear over their headsets the voices of Shuttle crew members and Houston mission controllers portrayed by the Sim Team members. When the test is over and the participants pass the gremlins in the hall, they may not even recognize them as the source of their stress. If they know us, I think they pretty much respect us because they dont want to get on our bad side, jokes Bob Holl, Sim Team and USA test project engineer. I believe they really do appreciate the job we do. KSC managers really support us because we reap real benefits from this. According to Frostrom, Its smart to take advantage of these testing opportunities. They not only prepare the primary launch team, but also deepen our resources by training up-and-coming engineers.No lull in launchesIn Firing Room 1 of KSCs Launch Control Complex, Shuttle launch team members put the Shuttle system through an integrated simulation. The control room is set up with software used to simulate flight and ground systems in the launch configuration. A Simulation Team, comprised of KSC engineers, introduce 12 or more major problems to prepare the launch team for worst-case scenarios. Such tests and simulations keep the Shuttle launch team sharp and ready for liftoff. The next liftoff is targeted fo r Oct. 29. SPACEPORT NEWSAugust 28, 1998 Page 6 Run for your life! Mark your calendars for this years Fall Intercenter Run slated for Sept. 24 at 5 p.m. at KSCs Shuttle Landing Facility. The 10K, 5K and 2-mile run/walk are all great ways to have some fun and friendly competition with coworkers. All KSC employees are invited to participate, and registration is free. Stop by either KSC Fitness Center by Sept. 14 to preregister. T-shirts and tank tops can be ordered at any NASA Exchange Store. If youre interested in volunteering to help at the event, contact Amy Douglass at 867-7829. Silver Snoopys awarded to employees Seven Silver Snoopys were awarded last month to USA employees. Astronaut Rick Sturckow, who will pilot the first International Space Station flight scheduled to launch in December, presented the prestigious award in July to Jim Cheek, Debra Favata, Greg Harlow, Rick Hicks, Tracy Hokett, Michael McCarley and Pete Sanstead.Property Awareness custodians honored for their efforts Material Management Branch Chief Debbie Bayline was keynote speaker at the seventh annual observance of the KSC Property Awareness Week. She provided insight on planned property management policy changes.Days of Caring approaching Dont forget to join KSCs NASA and contractor team during this years Days of Caring project to paint Baxley Manor, a building of resident apartments for senior citizens, in Merritt Island. Today is the last day to register in order to participate in the Sept. 11 and 12 project. If you have questions or would like more information, contact either Cindy Coddington at helen.coddington1@ksc.nasa.gov or Liz Osborne at elizabeth.osborne-1@ksc.nasa.gov. Property custodians with excellent track records were singled out for recognition during Property Awareness Week in August. This years theme was Show You Care Be Property Aware. In the seventh annual observance of the week, held Aug. 12 at the KSC Visitor Complex, KSC Deputy Director for Business Operations James Jennings delivered opening remarks and presented awards, along with Logistics Services Division Chief Greg Opresko, to the honorees. Individual organizations were also honored. Approximately 1,600 custodians throughout KSC received promotional tokens. The Boeing Company chaired this years event with John Blubaugh as chairman. He acted as emcee for the event and stated that the PAW activities communicate the importance of managing KSC government equipment resources, which total 144,500 items valued at $5.6 billion dollars. The awardees were: NASA: Edith Hoggard, Laurel Lichtenberger, Lee Maull, Bobby Pulliam, Margaret Rosenberry, Matthew Smisor, Beth Smith, Ginny Stagman, Jennifer Starkey, Richard VanGilder, Brian Welliver United Space Alliance (USA): Sharon Andruss, David Covert, Alan Bredberg, Sharon Lee, Michael McGuirk, Michael Nattress, Kathy Nelson, Alvin Pittman, Susan Ruiz, Peter Stonk, Larry Taylor, Veronica Taylor, Robert Thomas, William Brown, Diana Townsend, Edward Walters, Ed Wolf, Walt Young Wiltech (USA subcontractor): Perry Whitehurst Boeing: Dan Anderson, Bart Faulkenberry, Don Gooch, Karen Kremkau, Kirk Landfried, Mike Pelache, Bruce Smodell EG&G: William Barousse, James Cochran, Cheryl FitzSimon, Timothy Francisco, Kenneth Hooks, Barbara Jones-White, Joan Scotto USBI: Alex Gorichky, Steve Nugent, Roz Stephens Delaware North Parks Services: Ron Carpentier, Albert McManus, Paul Hughes, John Lytwyn The following organizations also were honored: Boeing: Logistics and Automation Systems Delaware North Parks Services: KSC Visitor Complex EG&G: Computer Services Division NASA: Shuttle Processing USA: Integrated Data Systems USBI: Production Operations Jennings addresses toastmasters at kickoff meetingJames Jennings On Aug. 12, KSCs Deputy Director for Business Operations James Jennings addressed a KSC club of Toastmasters International in the Headquarters Building to kick off KSCs new emphasis on this training course on communication and leadership skills. Jennings reaffirmed the endorsement of Center Director Roy Bridges.Space center employees are constantly in the public eye and in situations that require you to represent the United States space program, said Jennings. I encourage you to develop your communication and leadership skills to meet this challenge. Toastmasters International is a worldwide organization devoted to improving communications skills from learning to think and answer on your feet to delivering presentations to a large audience. Many famous people have developed their skills through Toastmasters, including former astronauts John Young and Walter Schirra and Senator Sam Nunn. For more information on training sessions at KSC and Cape Canaveral Air Station, contact Derwood McKinley at 867-1596. 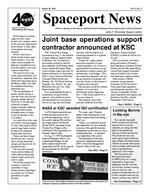 SPACEPORT NEWSPage 7 August 28, 1998 People often associate accidents with production or skilled labor-related activities, but did you know that last year, administrative areas accounted for 75 percent of all KSC injuries reported? In response to this and as part of KSCs new safety culture, NASAs Safety and Mission Assurance directorate developed a special mandatory training course for all KSC civil service employees. The course initially was designed for senior managers, and the first class was conducted June 29. During the class, NASA senior managers outlined their responsibilities and goals as they relate to safety. In September, the orientation course will be offered for employees. The course designation is K12129. The main goal of the course is to reinforce KSCs safety culture of reducing the number of mishaps. Additional emphasis will be placed on developing positive attitudes for New safety training course for NASA at KSCSafe tips you can bank on proactive initiatives in correcting unsafe situations or conditions by contacting the right people to fix or correct the problem. KSCs safety culture calls to everyones attention that safety is truly everyones responsibility. Line organizations are responsible and accountable for areas previously considered to be exclusively Safety Office functions. This is a find it and fix it kind of program, said Don Vycital, lead safety and occupational health specialist in the Industrial, Payload, ELV, and Space Station Safety Office. While there will be some paperwork in fixing safetyrelated concerns, the new safety culture focuses heavily on action, not reaction and facilitating fixes, not burdening the system with paperwork. Every NASA employee at KSC will recieve a memo with details regarding class dates. Keep exits clear. Clean up objects or liquid spills when they happen. Maintain tools & equipment in good working condition. Always use the right tool for the job. Always close file drawers before leaving the area. Look twice and stay alert in hazardous work areas.ISO ...(Continued from Page 1) Jubilant in celebration of KSCs achieving ISO 9001 certification are, left to right, KSC Center Director Roy Bridges, Business Innovation Group Chief Laura Gosper, Business System Manager Rey Diaz, and DNV Southeastern Regional Manager Dalton Lyon. Audit Manager Rob Ellison from the BIG office is standing behind Bridges. As NASAs center of excellence for launch and payload processing systems, KSC will use this certification as a tool to improve an already world-class team. This achievement validates the excellence of KSCs management system, said Bridges. As we enter the new millennium focusing more on research and development responsibilities, ISO certification is the baseline for continually improving our management system. The certification effort was led by the Business Innovation Group (BIG), whose charter is to develop and support a long-term business system for the center. BIG was instrumental in preparing the center for and coordinating the ISO audit. About 500 KSC people were directly involved in the development and internal audits of the system. Without leadership commitment, ISO implementation is an impossible task, noted Laura Gosper, chief of BIG. She also noted that ISO certification is a meaningful tool for improving the way we do business at KSC. Bridges agreed. Were in the space business, he said. We demand high quality and high reliability from our suppliers for all the parts and services that we need in our business, and so it seemed logical to require our suppliers to submit themselves to this ISO 9000 certification process. Having made that decision, its also easy to understand ... that we need to submit to it ourselves. He highlighted lessons learned International Standards Organization (ISO) requirements. All NASA centers are required by NASA Administrator Daniel Goldin to be ISO 9001 registered by September 1999. NASA is the first federal agency to seek full certification. KSCs certification applies to management of space systems, test and launch techniques, development of associated technologies and enhancement of core capabilities. In addition to the ISO 9001 going through the ISO certification process, stating: The ISO standard is not something that just our traditional quality organization would use, but its an overall business system for everyone. We needed to change a lot of the ways we do business here and that required leadership at all levels of the organization. ISO is not a flavor of the week. Its a context for many different flavors, or tools, to assist us as we continue to get better. The business management system we certified contains our strategic planning process which helps us define where we want to go our corrective and preventive action processes to help us continually improve and also our benchmarking and metric tools and processes to help us gauge our progress against internal goals as well as industry standards. Congressman Dave Weldon was on hand to congratulate KSC workers. Weldon is serving his second term as the U.S. representative of Floridas 15th Congressional district. He also serves as vice chairman of the science committee subcommittee on space and aeronautics. This is a great thing youve all accomplished, Weldon noted. Youve stepped up to a challenge here. KSC is setting a standard not only for NASA but as well for the space industry as it includes commercial as well as military. ISO 9001 comprises the most detailed, comprehensive set of standard requirements for quality management systems. To date, nearly 20,000 U.S. organizations have received ISO 9000 registration based on certificate that Bridges accepted from DNV, Dalton presented the center director with a special plaque marking the 2,000th ISO certificate issued by DNV in the United States. The future of NASA and Kennedy Space Center is critical to our nation and indeed to the world, said Lyon. This future hangs very much in the care of their newly implemented system. DNV is proud to be part of the group that supported KSC during this endeavour. John F. Kennedy Space Center Managing editor. . . . . . . . . . . . . . . . . Bruce Buckingham Editor. . . . . . . . . . . . . . . . . . . . . . . Susan Maurer Editorial support provided by Sherikon Space Systems Inc. Writers Group. NASA at KSC is on the Internet at http://www.ksc.nasa.gov USGPO: 633-112/80013Spaceport News Spaceport News is an official publication of the Kennedy Space Center and is published on alternate Fridays by the Public Affairs Office in the interest of KSC civil service and contractor employees. Contributions are welcome and should be submitted two weeks before publication to the Media Services Branch, AB-F1. E-mail submissions can be sent to Susan.Maurer-1@ksc.nasa.gov SPACEPORT NEWSAugust 28, 1998 Page 8 Each year, in accordance with federal regulation, NASA employees are given an opportunity in the workplace to Touch Somebodys Life, the theme of this years Combined Federal Campaign (CFC). A web site is already active to provide you with information on how your past and current contributions are doing just that. Through the site, located at http:/ /ap03.ksc.nasa.gov/CFC/ or through the link provided on KSCs internal page, you can find out who your directorate Putting on a new coat for fall Combined Federal Campaign establishes websiteThink painting your house is daunting? Try painting a flag that spans an area 209 feet by 110 feet, or about 23, 437 square feet. Seen here suspended on platforms from the top of the 525-foot-high Vehicle Assembly Building (VAB) at KSC, painters are busy giving the American flag a facelift and replacing the bicentennial emblem with the NASA logo. Each stripe of the flag is 9 feet wide and each star is 6 feet in diameter. The NASA logo, also known as the meatball, will measure 110 feet by 132 feet, or about 12,300 square feet. The painting platforms are operated by two electric motors and travel 35 feet per minute. The work, honoring NASAs 40th anniversary, is expected to be complete in mid-September. The work is being performed with rollers and brushes and will require about 700 gallons of paint, which was donated by Devoe Coatings, a member of the ICI Paints World Group. The entire fleet of orbiters also is receiving the addition of the NASA logo on their wings and sidewalls. Discovery will be the first to reveal her new look during roll-over to the VAB, currently scheduled for Sept. 14, from Orbiter Processing Facility Bay 2. Discovery is scheduled to launch on Oct. 29 at 2 p.m. representative is, read about local success stories, check out frequently asked questions and answers, read about what your gift can buy, locate an index of charities, find out about visits to local agencies, and more. This years campaign kicks off Oct. 1 and runs through the end of the month. The goal this year is $210,000, which is a five percent increase over last years goal. Check out the website now, and stay tuned for more information in upcoming issues of Spaceport News and Countdown .Deep ...(Continued from Page 4) Three solid rocket boosters will be attached around the base of the first stage the next day. The second stage will be mated atop the first stage on Sept. 15, and the dualsector spacecraft fairing will be hoisted into the cleanroom of the pads mobile service tower the following day. Deep Space 1 will be transported to Complex 17 on Oct. 5 for hoisting aboard the Delta rocket on Pad A and mating to the second stage. After the spacecraft undergoes state of health checks, the fairing can be placed around it three days later. At press time, launch of Deep Space 1 is targeted for Thursday, Oct. 15, at 8:42 a.m. The launch period ends Nov. 10. If the spacecraft is healthy when the primary mission is completed on Sept. 18, 1999, NASA could choose to continue the spacecrafts voyage. Deep Space 1 may then be on a trajectory resulting in the flyby in January 2001 of the dormant comet Wilson-Harrington that is in the process of changing from a comet to an asteroid. Finally, in September 2001, as the spacecraft continues on this trajectory, it may also do a flyby of an active comet, Borrelly. Conducting science will prove that the technologies are compatible with demands of future missions and will ensure that this rare opportunity to encounter such a variety of fascinating solar system bodies during a short mission will be fully exploited.